There is understandable unanimity among many commentators today regarding the calamitous effects that Structural Adjustment Policies (SAPs) have had on the populations of most developing countries. Yet there are some who would argue that SAPs are not intrinsically bad, and could bear fruit ifimplemented and followed courageously. The World Bank (WB) has taken the position that the effects are dual, i.e., opportunities are created for some, while the effects are wrenching for others [WB:1995:108]. 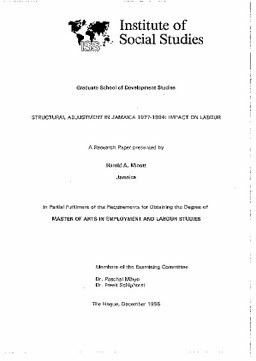 Such bipolarity in assessing the impact and appropriateness of SAPs is widely reflected in an ongoing debate among Caribbean academics, the findings and prognoses of whom may be as diverse as the many .perspectives that are brought to the discussion [Theodore: 1992: 1-4].